Looking toward the cabin door. The funky round shower. The doors come from each side and form a capsule. Logan airport as viewed from the ship when we left. Yacht Four Wishes. It's a charter yacht just waiting to take you where you want to go. Stores at the entrance to the docks where we tendered in. The sand bar where Bar Harbor gets it's name. A view to show the large tides here. Another view of the Jewel and the bar. A view of the Porcupine islands. The little mound in the middle of the picture in the water is a beaver house. The view of Jordon Pond from the front lawn at the Jordon Pond house. We stopped at the Asticou for a "Lobsta" lunch. A front view of the Asticou. The gatehouse of somewhere I can't remember. Bar Harbor as viewed from above. The Porcupines, the Jewel, and Bar Harbor from above. Onward to Canada. This is the Peggy's Cove Nova Scotia lighthouse. Patty "posing" for me. The lighthouse actually has a post office inside it. Patty's knee was acting up so she waited for me for a few minutes. Click on the link to the right to see a panoramic shot of de Garthe's Fisherman's Monument in Peggy's cove. It's carved entirely from the natural granite rock showing the cove's heritage. Our stop in Sydney NS was skipped due to Hurricane Ivan remnants. The night before our scheduled stop, the captain announced we were going to encounter weather from Ivan. We encountered 35-40' seas and watched the ship info channel show winds across the ship from the port side at a constant 60-80mph with at least one gust I saw reach 125mph. Everyone was told to not go out on deck. Of course I had to just take a peek. I went out near the stern up on the upper deck. It was dark so it seemed even scarier, but I got about 10 feet or so from the rail and backed off and went back inside. Wind was strong enough to be pushing my 300+ body around like a piece of paper. Numerous people on the port side of the ship opened their balcony sliding doors only to have them blown off the tracks. An exciting night to sleep for sure. But the Jewel performed VERY well. A town along the St Lawrence Seaway. An odd little ship we passed. There was a bunch of water in the center part of the ship churning around and draining off the sides. Got me what it was doing. Canadian Coast Guard twin hull. Looking toward Isle d'Orleans in Quebec. Unfortunately a hazy day as we approached Quebec City and the QM2. Hotel Frontenac. Construction began in the late 1800's and finished in 1933. For a stitched version, click on the link to the right. Hard to believe this is painted on the flat side of a building. 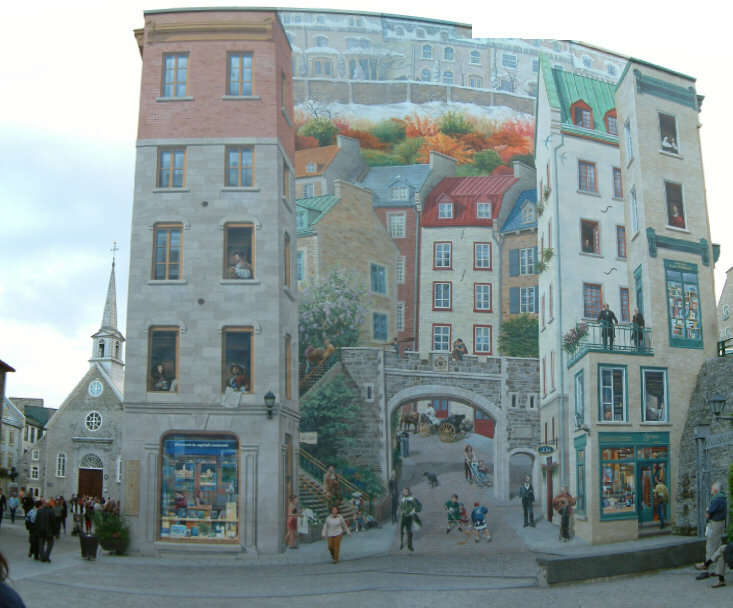 Click to the right again for a panoramic view of Old Quebec City in the morning sun. We had lunch at the restaurant you see at the top. This is Montmorency Falls. The falls were named by Samuel de Champlain in 1613. They are 76M (247 feet) tall. That's 87 feet taller than Niagara Falls. Looking out at the bridge to Isle d'Orleans from the bridge over the falls. Looking into Eternity bay. This was our turning point where we headed back down the river. The top of this bad-boy is 1800 feet. The Virgin Mary, completed in 1880 as a result of a promise between a man, who escaped death twice, and God. It's 28 foot tall. It was brought up the side of the cliff in pieces and reassembled on top. We pass the Regal Princess. Throughout the fjord, are these metal "pads". They are helicopter landing areas for rescue purposes. Folks whale watching from the Bow. A couple of kissing swans. A view of the public dock from where we ate at the Market Square Grill & Deli. The "reversing" falls in Saint John, NB. The tides here are 28 1/2 feet. The largest in the world. The falls reverse directions every 12 hours. In the morning the water is rushing IN and back OUT in the evening causing the falls to reverse direction. The elaborate "jetway" used to get off the ship. It has numerous switchbacks to compensate for the 28 foot tides. Temporary tents with shops until the passenger terminal gets built. We were warmly welcomed to Saint John. The women were given roses as we got off the ship and the men were given Saint John lapel pins. The pattern in the water is caused by the water from the river rushing into the sea during low tide. One of the islands of Casco Bay. One of the Jewel's tenders coming into port. The Polar Adventure. A new tanker built in New Orleans and brought up to be finished in Portland. Our guide said it was due to the Hurricanes down south. It holds 42 Million gallons of oil. The white line you see was run through a block and tied off to a Dodge Ram pickup to keep the Appledore III along side the pier. It was pretty bumpy even inside the breakwater. Our ferry to Martha's Vineyard. Vickie, one of our cohorts in crime. Vickie and Carol met us in Boston after the cruise. The Gay Head Light in Martha's Vineyard. Built in 1856. Automated in 1960. It flashes Red and White. Gay Head has been renamed Aquinnah to be more PC. WONDERFUL Quahog (pronounced Ko-hog) chowder. A Quahog is a hard-shell clam.